Today we’re looking at a gaming mouse with a high-powered sensor, a weird name and an even more unusual shape: the Tesoro Gandiva. This laser mouse boasts an 8200 DPI sensor, the Avago ADNS-9800, and eight programmable buttons. It’s an impressive total, but much of a difference do they make? Let’s take a look. 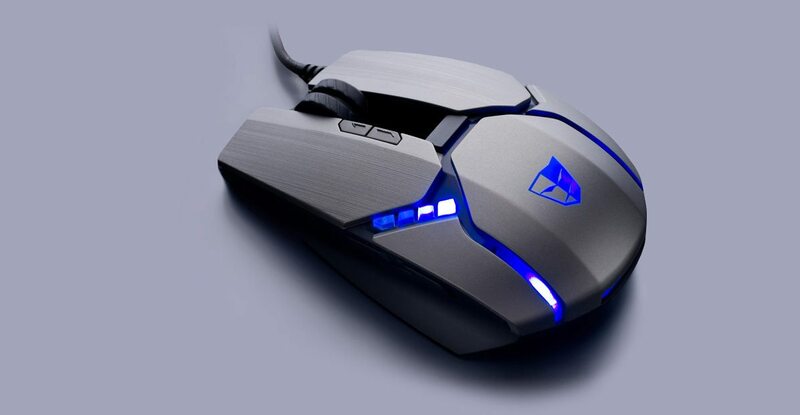 From the first glance, it’s clear that the Gandiva is a mouse with a few unique design elements to set it apart from the legions of gaming rodents. The most notable feature is that the left and right mouse buttons jut out by themselves, joined only by the mouse wheel in the centre. This produces a hole behind the mouse wheel, which is a little weird initially but as a design decision is quite defensible. It does mean that the sensor is displaced from its usual position in the centre of the mouse, but this doesn’t seem to have an impact on usability. Behind the scroll wheel we have a DPI adjust button, which toggles between four different potential settings. Also next to the scroll wheel we have a pair of tiny buttons, which also allow you to adjust the DPI up and down to suit your tastes. By default, the highest DPI setting is 8200 and the lowest is 800. Sections of the angular plastic body are further divided by channels of partly-transparent plastic, which are lit by blue LEDs. It’s an interesting effect which brings lighting to the whole chassis, instead of only coming from a backlit logo or the prow of the mouse as is more typical. The logo at the back and the wheel also light up, and these can be coloured to suit your taste. The left-hand side of the mouse has a small grip and two buttons, mapped by default to forward and back. The left side is also home to a quartet of plastic LED-lit DPI indicators, which form a subtle ridge that feels a bit like a button. The right-hand side of the mouse is bare, without any additional buttons or other features. From the front, the free-standing scroll wheel looks quite cool. You can also see the cable, which attaches to the bottom of the right-hand side. Looking now at the bottom of the mouse, you can see teflon mouse skates in each corner, with the sensor sitting near the smaller of the two rear skates. Apart from the usual regulatory information and branding, there are no further features on the bottom – no removable weights, for instance. 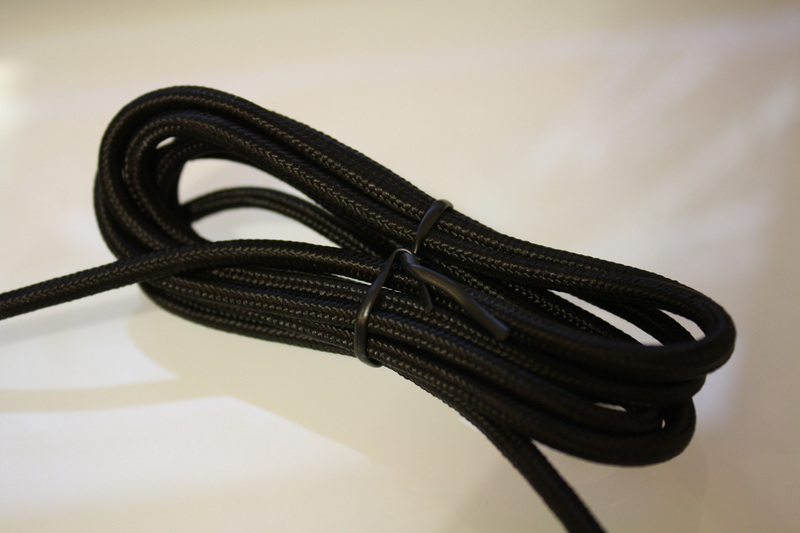 The final parts of the mouse to examine is the cable, which is 1.8 metres long and sleeved, and the USB connector, which is gold-plated. 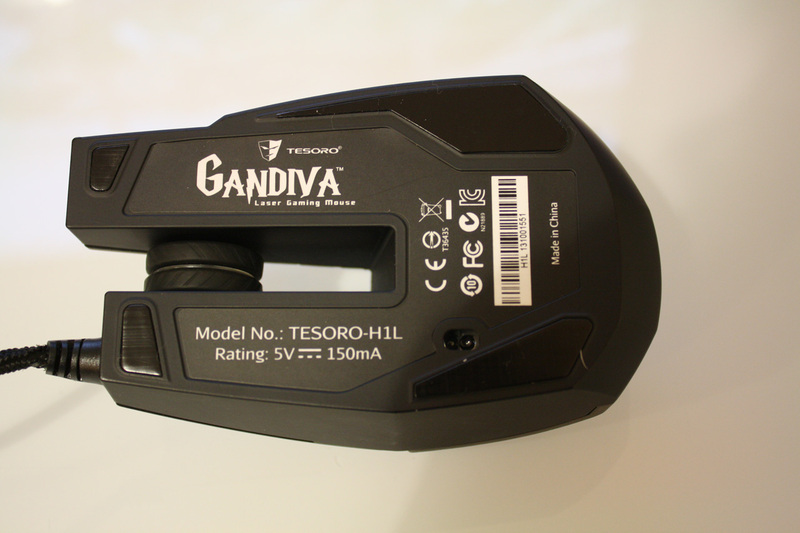 The software provided with the Tesoro Gandiva ticks all the boxes. Each button can be remapped, with the eight buttons and two scroll directions giving you ten remappable controls in all. You can adjust the various DPI settings on offer too, including setting separate x and y values. Shooting speed, polling rate and liftoff distance can also be fine-tuned in the Gandiva software. There are five user profiles which can store these settings, making it easy to optimise for different games or applications. Macro settings are also present, even though these tend to be a little less useful on a mouse than on a keyboard. Still, you can assign multiple button presses and delays to the various buttons, letting you automate complex or oft-repeated actions. That’s probably most useful in an MMO, but can find use in other genres and applications as well. When it comes to cosmetic changes, you set the colour of the logo LED and scroll wheel LED but not the main body LEDs, which can only be blue. This can be a nice way of indicating what profile you’re currently using. In order to put the Gandiva through its paces, I used the Gandiva as my primary mouse for work – writing, Photoshop and the like – and play. On the gaming side of things, I played quite a lot of Counter-Strike: Global Offensive, as well as lesser amounts of StarCraft II, Heroes of the Storm, Dragon Age: Inquisition and Borderlands: The Pre-Sequel. Let’s get onto the results! The Gandiva is a gaming mouse, so we’ll begin there. Generally, I found the Gandiva a strong performer, with its light weight and comfortable shape providing many happy hours of gaming. I tend to use a hybrid grip(somewhere between claw and palm), and all three positions felt comfortable enough. I judged its performance to be better than the (more beautiful) Cougar 700M, which I found less precise in high-intensity games like Counter-Strike: Global Offensive. That might be down to the sensor (which is shared with past favourites including the Corsair M90), but I would guess it speaks more to the more traditional shape of the body of the Gandiva. I expected the unusual peninsula-style buttons to make a difference, but honestly it felt very similar to many other gaming mice. However, there were still some issues here and there. As I’ll mention again in the work section, the additional buttons aren’t too convenient to reach. I generally use side buttons to activate voice comms (or melee attacks in Call of Duty), but here I had to adjust my grip more than usual to press them, so I used them very little. The buttons on the side of the left mouse button were also quite difficult to press, given their tiny size and weird placement. Ultimately, I would have preferred more traditional placements on the left and right sides, or even one or two to the left of the left mouse button as on the Cougar 700M. Generally work is rather less demanding on a mouse than gaming, but still presents its own challenges. The biggest is comfort – can I use this mouse all day without any strain or discomfort? The majority of mice easily pass this hurdle, but some unusually shaped ones can prove uncomfortable. Thankfully, the Gandiva’s shape and size proved just perfect; I didn’t experience any discomfort and mousing around Windows went just fine. The mouse was light enough to scoot around my desk and go in my laptop bag without any troubles, and accurate enough for precision movements in Photoshop. One trouble point I’ve found on many gaming mice was the scroll wheel, but this was mostly okay. Scrolling felt fine, with a little feedback without being too loud or clicky. Clicking down on the scroll wheel – middle clicking – felt a bit odd though, which I put down to the unusual construction of the mouse. It was a bit harder to middle click accurately; it felt like the mouse was moving a bit instead of remaining stationary during the middle click. It wasn’t an issue, but it was a noticeable difference that might annoy some people. The only other possible complaint was the positioning of the back and forward buttons. I had to adjust my grip in order to hit these, which isn’t ideal – you’d prefer the buttons to be positioned right under your natural grip. It wasn’t a big stretch, but again it was a small point against the Gandiva and a flaw that I haven’t found in many other mice. 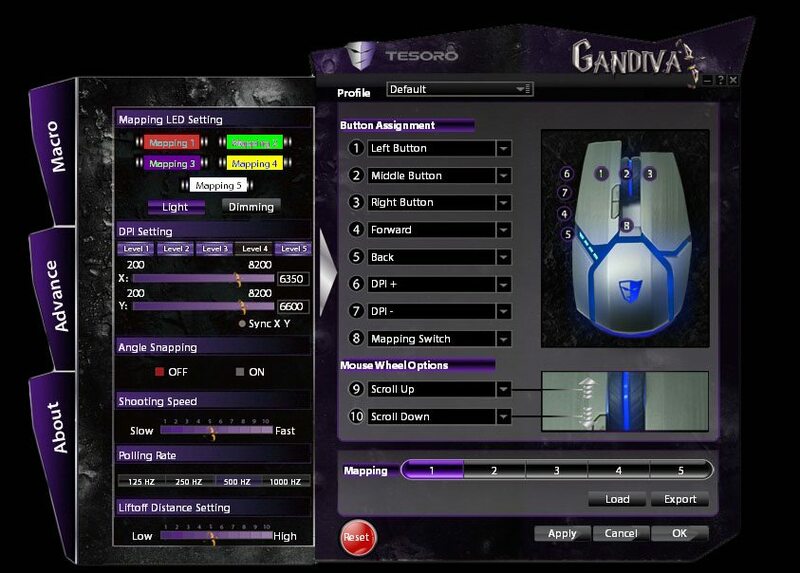 I like the Gandiva as a basic gaming mouse. It is accurate and comfortable, and these two traits are the most important. However, in other areas it falls short – its extra buttons are programmable, but placed inefficiently. Its scroll wheel is well constructed, but clicking it feels shaky. Its backlighting is cool, but only the logo and wheel have adjustable colours. These are small drawbacks, but might be enough to count the Gandiva out for some people. If they don’t bother you though, then you’ll find the Gandiva to be a solid gaming mouse for a reasonable price.